Canadians love their loyalty programs, and digital channels are a favourite method to learn how to eke the most value out of those Air Miles, PC Points, and the like, according to a research study by Yahoo Inc. The average Canadian has four loyalty program cards in their wallets, the study found. More than half of consumers say they frequently use those cards to accumulate points and miles. Two-thirds of them go online to calculate the value of the loyalty program, and six out of 10 choose loyalty programs that come free-of-charge. You could say that the research shows Canadians are thrifty. Claude Galipeau, country manager for Canada at Yahoo, says that Canadians are concerned about value and want information about loyalty programs relevant to them. 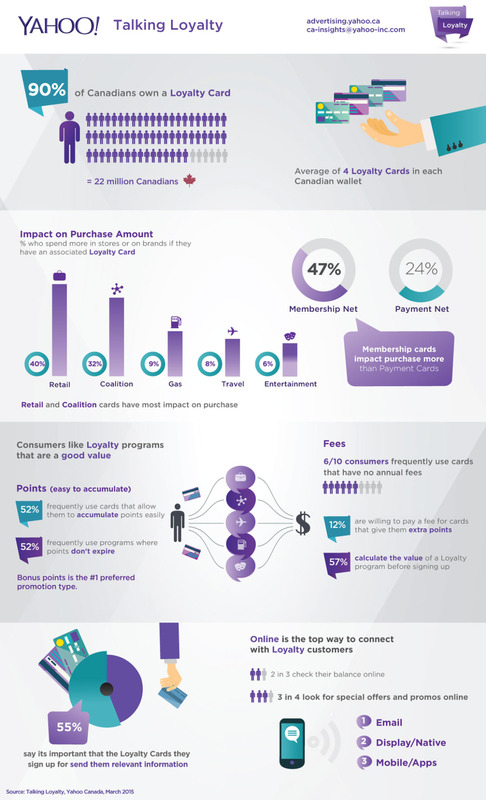 Yahoo’s study indeed shows that 47 per cent of loyalty cardholders say that loyalty programs have an impact on how much they spend. One-third of all consumers say they will buy more products or services if they can earn more points as a result. Galipeau says he’s a big user of loyalty programs. When asked to name his favourite, he declined to do so, as if being asked to choose a favourite among his children. Other Canadians that enjoy playing the loyalty game are looking to digital channels to get more information on how to maximize their value. Email had the greatest impact on awareness of loyalty programs, Yahoo’s study shows, followed by display and native advertising, then mobile apps. If your brand is targeting the millennials demographic – defined by Yahoo as those between 18-34 – you will want to put even more emphasis on mobile communication. Millennials are five per cent more likely to spend an increased amount due to their loyalty cards, and two times more likely to prefer mobile for loyalty information.